Top 10 things to do. Water’s Edge is a very welcoming and comfortable house. It's in a great location: close to the town - handy for meals - and across the road from the forest - great for morning walks. The house is very well equipped with everything you could need and has lots of spaces where the family can get together and relax. We loved it ! Easter break. We had family members across from Melbourne and they had not been to the region before- this house and surroundings were a perfect introduction! Everyone (including the dog) thoroughly felt refreshed and relaxed after our time at WATERSEDGE. Really appreciated having milk in the fridge ready for our tea after the long drive down. Thanks again for the use of a very special place. We stayed at the house with four adults four children and the family dog. The house has everything you could possibly need and had a great fenced yard for our dog and the young children. It had a terrific entertaining area and beautiful bushland walks only minutes away. Helen was very accommodating and even left us some beautiful local wine and chocolates! 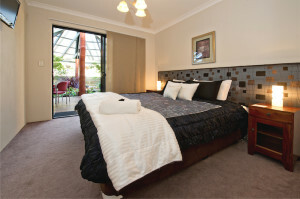 A great place to relax and enjoy all of the wonders that the Margaret river area has to offer! Would definitely stay at this house again. With family over from the UK I was looking for a property that was large, comfortable, well equipped & in the heart of Margaret River. Water’s Edge certainly fulfilled all my expectations, a stunning property with impressive views & gorgeous bathrooms! Being able to bring our dog was the icing on the cake as she is part of the family & travels everywhere with us. All the little extras made a huge difference & would highly recommend Waters Edge to anyone looking for a relaxing, peaceful break in the heart of Margaret River. Thank you Helen & Frank you have a stunning home & we can't wait to come back again real soon! Our group consisting of four adults spent last weekend at Waters Edge and rated it as an exceptional home. Frank and Helen should be highly commended on their design and attention to detail from the luxurious features throughout the property to the smallest statue that gives the home a welcoming, international resort feeling that simply makes you want to stay forever. We took particular note of the many secluded dining / lounge / garden areas that one could escape to if alone time was preferred. The walled water feature was amazing and a great location to chill out with a glass of wine. Beautiful bedrooms, linen, kitchen and especially the bathrooms. WOW! The property location is excellent, close enough to town and near walking trails along the river. Thank you Frank and Helen for being so accommodating, 10/10 for customer service and we will definitely be returning. Wonderful facilities! There were 7 of us and we stayed for 2 nights. The kitchen was very well equipped, plenty of space to move with great outdoor seating areas, all of the house was beautifully furnished and decorated. You could definitely see how much care has gone into making the house feel welcoming and comfortable. We were very impressed by the extras (big DVD collection, heaps of board games) and everyone wanted to stay longer! The location was perfect - close to town, with a forest just on the other side of the road with walk trails and the river that we thoroughly enjoyed. Lovely quiet area, very relaxing atmosphere. It was everything we were looking for and more! With my family from the UK we thoroughly enjoyed our time at Waters Edge. The house is amazing and has so many different areas we meant we could all be together our have our own space. A beautiful place to stay. Rented in Australia for years , this has to be one of the best we have experienced , cannot fault location , presentation , and attention to detail. Would recommend this property , would certainly consider another rental should the opportunity arise. We spent two nights in this property. It is very well equipped, beautifully designed with great style and lovely finishing touches. A central and quite location. A lot of thought and presentation has gone into this great place. l would definitely recommend it! It’s a shame we are so far away as would like to visit again. Helen was very friendly, helpful and quick to respond to my queries. The house was beautiful! It was clean and very well presented. I wouldn't hesitate in recommending Waters Edge. The house was so beautiful and I wish we could have spent more time there to enjoy all the different areas. You made the communication easy. © 2019 Waters Edge Margaret River. All Rights Reserved.